My friend Leslie over at My Country Home had an interesting post today...I decided to do my own version of it.......what do you want out of life? I have done both sides of the fence so to speak...I worked fulltime while having 3 children. I had no choice. I had all of my children in my 30's...so I was a bit older than some...anyway in January 1999, the company I worked for for 20 years had a buyout. I was the 3rd person to sign up! I knew it would give me the chance to stay at home with my children and at the same time give my husband a chance to re-start his career. In 1996, he lost his job of close to 20 years in a lay-off. After a couple of years of doing commission only jobs, we decided to take the next big step...he would stay home with the children while I worked during the day...he did a job in the evenings...this worked, but it wasn't what we really wanted...so...when the buyout was offered...this was perfect. I love staying at home with the children. It has given me chances to let them have play-dates, no babysitter, be there when they arrive home on the bus, etc. Has it been easy these past years? No! Has money been tight? Yes! We have struggled many times......but I do think we have provided a great home for the kids. I don't need big trips, fancy cars, lavish house, etc. I watch my husband's family try to one up each other and I wonder if they are really happy, or is this a game they play. I will never have the material things they have.....nor do I need them. I have been doing alot of reading lately and trying to come to terms with what I want to do with the rest of my life. I do believe that once my youngest is a bit older, I will look for a part-time job...yes, I will be in my early 50's by this time, but I think it's something I need to do. We'll see. I believe that what is meant to be...will be. At any rate....some deep thoughts for a Monday morning. Sorry I didn't get this drawn sooner.....I did post a comment on your blog, can you email me when you get a minute? I was 15....my love of Elton John began....."Daniel" was the first song I took notice of....followed by each and every one of his songs that came out...one after the other.....many summer evenings, hanging around with my friends and my cousin..at "The Canteen".........listening to his music on the juke box in the back room......fast forward 35 years......same cousin and I are sitting listening to "Daniel" and all those other wonderful songs being performed LIVE by Elton.....pretty amazing when you actually think about it...and wonderful, wonderful memories. Two hours and forty five minutes that man played.....no break......it was a once in a life time experience and one I will never forget...it was even more special that one of the people I went with was my cousin who shared those memories from 35 years ago. I am going to see Elton John!!!!! I cannot believe the day is here! I have liked his music since first hearing the song "Daniel" when I was 15....followed by all his other wonderful music. He is actually playing our city tonight and tomorrow night! I am fortunate to have a ticket for tonight's show!!!! I am going with my 3 cousins and we are going out to eat before the concert. Other than that...(what could top that today???) it will probably be an uneventful day here in our household. We do have to take the dog back for a checkup after her surgery on Monday, and the children have an inservice day at school, so are home, but that's about it. I just finished stitching this chart this morning. If you would like to have this chart to stitch...leave me a comment. I don't know how many stitchers read this blog, so if there is more than one person that wants it...I'll draw for it on Saturday. Have a great day everyone! I'll post a photo of my finished piece later. Thank you for your wonderful comments on my mom! It means alot to me. Yesterday was stressful in another way, one that I did not post about here, as I thought it would take away from the post on my mom,but I did post about it on a messageboard I frequent. Nala (Nallie as we call her), our 10 year old beloved dog underwent scheduled surgery for a tumor yesterday. I spent yesterday missing her and worrying, as she's always at home with me. I am happy to say that the operation went well, she is back with us as of 8:30 last night. She will need some loving care and nursing back to health, but the operation was successful. My DH is working from home today to be with her, as I am heading out with my two cousins to get some apples and do a bit of shopping! Over the past few years, I have participated in several Round Robins...and have enjoyed them all. This particular piece I was involved in a few years ago, and I really don't think I had a "THEME". There were to be 9 sitchers, some from Canada, locally actually, and some from the US. During the course of the RR one girl dropped out, so I actually stitched two squares myself. This Round Robin actually hangs in my sewing room now.....I had the frame made by a cross-stitch shop that has since closed. The frame is a dark blue..(I think I went by DMC colour 931). I told my fellow stitching Blogger that I would post a photo of this today. Speaking of Round Robins, I thought I'd also post this photo...also in my sewing room. This is another Round Robin that I did several years ago, it is Lizzie Kate's seasons and this one went from me, to the US, over to England and back to me. I really like this one too and had the frames made for it, and the same colour DMC. I'm not sure why one photo is showing blurry, it really isn't in person. I haven't done any RR's for a few years......I may get back to it at some point, but for now, I enjoy just stitching what I want, when I want. Enough of feeling a bit sorry for myself......my mood has greatly improved today. It could be the sun that is brightly shining, or it could be the fact that I decided to have my hair cut and foils put in last night (a real treat for me), or the fact that I have decided ENOUGH! I don't like feeling sad, or icky, and I'll do my best not to. Today I met up with my two cousins for "Blanket Club". It was great to get together again, and hopefully our weekly meetings will be back on schedule now that fall is almost here. These two cousins are like older sisters I never had. We had lunch (oven toasted tuna/cheese burgers) cut up veggies, melon, tea, and brownies and carrot cake for dessert...okay, admittedly part of these meetings are the food! LOL We worked on our swedish weaving blankets and discussed the possibility of attending a water exercise class on Monday mornings. Also, next week we will meet on Thursday and go on a "field trip" (we take these Blanket Club meetings seriously...heehee). We are going to go to get some apples and to a second hand shop....can't wait! Also, next week is the Elton John concert!! It's one of those days that I feel like crawling back under the covers....it's dark, foggy, gloomy outside...and the air feels "heavy" if you know what I mean. I have lots I want to accomplish today, but I don't know if I will get it done or not. I have been feeling really "blah" lately, no specific reason, just icky. I don't have the ambition or desire to do the things I should be. I think in part it is the weather..we have had really odd weather this past month or so. I also don't like change and am a worrier. I am a "what if" person. I worry about my daughter leaving home next year and not being able to see her or make sure she's okay...silly I know..it's a long way off. I look at the beautiful young woman she has turned into..focused, smart, mature....and I wonder what happened to my "little girl". She's much more mature than I was at her age. But I guess that's what moms do..they worry. I think about my mom and dad every day. It is almost 2 years since my mom passed away, just over 3 since my dad. I miss visiting them and asking their advice. I miss watching them enjoy my children and my children enjoying them. It hurts that they no longer have an extended family that enjoys spending time with them. I think I am at a point in my life where I need a "purpose". I don't know what that is, but I need a focus. I need to change things in my life that I am not happy with. Anyone ever have days like this? I seem to have them alot....age never bothered me before....what happened? Well fellow bloggers....must go try to accomplish SOME of what I set out to do today! I really didn't mean this to be such a deep post today! I was asked how the whole party/clean your room went? Well, when my daughter got home from school I explained what exactly I had meant by "clean your room"....she and I organized things....and I told her how she needed to tidy up...it didn't all get done before we had to leave, but alot did. She went to the party and I'm glad she did. There were only 5 girls invited, and all 5 went and had a sleepover that night. They went to a Rock Climbing gym and had a great time. Her room still needs a going over, but at least it's just minor. I'll be checking it each night.....I am in NO way a neat freak....I just like it in some kind of order you know? As for our other daughter's car, we still don't know what is wrong, DH will talk to our mechanic today (hopefully) and see if he has any idea. I do have a feeling it's probably at the end of it's life...it's old, and well, we don't want to put alot more money into it....so we will probably be on the lookout for something else for her. I've been feeling really sad lately.....our oldest has decided that she DOES want to go away to university. 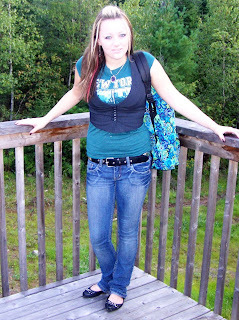 I cannot imagine her not here each day.....I know, it happens all the time, but I'm not ready for it to happen to us. I am proud of her and her accomplishments and how hard she works at school, but I will miss her greatly come next fall, and still hope for a miracle that she will change her mind and go locally. The problem with locally is that we have fantastic universities, but they are at the top of the price range in Canada, sadly. Have a great day everyone...I hope to get some cross-stitching done today. It is 10:45 am here, and I feel like crawling back into bed and wishing this day away..LOL....okay it isn't that bad, but it's just been one of those mornings. It started bright and early with my youngest looking for a permission slip she needed for a party tonight (rock climbing..indoors) and ofcourse yesterday I had asked her NOT to take that from where I had it, but she did and now can't find it...lovely....next I had asked her last night to tidy her room, by bedtime it wasn't done, so she was up early this morning seemingly doing it....I didn't have time to check before she got the bus, but when I did....geesh...I guess my defination of "tidy up" is not hers!! Needless to say, she will be in there when she gets home. I had a mind to keep her home from this party, but I won't be that harsh this time...the parents have paid for 5 girls to go and a last minute cancellation, unless unavoidable wouldn't be fair, so I'll deal with it another way. And now for the "better" part.....our oldest has a car that we purchased for her over a year ago. She needs a car for her job, etc...as we live in the country...well lately it has been having problems and our mechanic doesn't know what it is.....anyway, my husband had it a couple of days ago...and it worked fine, then it did the things she said it did...while he was on his way home, so it sat in our driveway...I was easily able to drive her to and from work yesterday and told her I could today, but she said no to today. My husband, in the meantime had planned on getting new tires on MY car today, so took it, and left his van here...I don't normally drive the van, but have keys. however when DH left, he took my keys and ofcourse probably had his in his pocket! LOL....So...a few minutes after he left, I get a call from our daughter...her car was acting up and she was at her friend's and they HAD to get to school. I call DH on his cell phone...he's out of range....GRRRR.....so I call the place where he is going...and eventually he calls me....he has to turn around and get DD and her friend and drive them to school.....so now we have to get her car fixed as soon as we can...she works hours that will mean alot of re-arranging in our schedules....or I let her take my car.....which will put me here without one....not really a big deal, but I really do use my car alot. I am ready to have a talk with youngest when she gets home AND her punishment has been decided. She WILL be allowed to go to this party, since I had already told the mom she could ..BUT she will not be going shopping tomorrow with her friends and her friend's mom as planned...she will not be having anyone over or go to anyone's house for a week, no sleepover next weekend that she wanted AND her room will be checked every night before bed to make sure nothing has been "hidden". I had started my post earlier and then had to save it for a while to help DH go get our daughter's car and get it back here. I still don't have my tires on...I hope that will get done this afternoon. 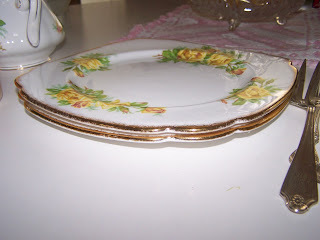 My cousin came over to visit on Tuesday, and I decided that since it was a beautiful sunny day with just a nip of fall in the air, I would get out my aunt's china to have lunch on. It reminds me of fall, with the gold/yellow in the flowers. We had a great time and enjoyed a nice lunch together. I am working on a new cross-stitch and sorry for the quality of the photos....I couldn't get it at a good angle and the edit part of the program is still not working. It really is quite pretty in person. Today I have nothing major planned...laundry, plan supper and later take youngest daughter to piano...it's her first lesson with a new teacher. I did another post this morning, posted it and then took it down....I needed to vent, I did, and life goes on. Leslie had some good advice for me.....hug my husband, realize what I do have in life. I cannot change people (this isn't my DH or children I am speaking of)...and so I will just "deal" with it. Today there is this big bright ball in the sky...I do believe they call it "sun"! What a wonderous sight after the weekend we had of rain and wind. And there is a nice breeze, so fall is definately in the air. Tomorrow night my youngest daughter starts back at gymnastics....Wednesday morning I have an appt with a specialist about my foot.......so, a fairly busy week. Take care everyone and enjoy your evening! Colleen, over at "And Baby Makes Five" is having a great Fall Giveaway....please go check it out! She's done fabulous job on everything. Last night I met up with my two cousins to go see Mama Mia....what an excellent movie! I loved it!!! I can't wait untl it's released on DVD, it will be on the top of my list. I came home mentally singing Mama Mia and woke up this morning with that tune in my head! LOL Those songs bring back wonderful memories from my teenage years. Today the sun is shining!!!! Amazing, considering the weather we have been having around here lately! However..we are due to get tropical storm Hannah on Sunday, and it's making me nervous...after living through a hurricane a few years ago...any storm makes me nervous. I HATE high winds and rain! We will be tieing things down as much as we can and also putting a lot in the garage until this passes. Since the hurricane a few years ago our whole land structure has changed because of the loss of the trees and therefore we get what appears to be lots of high winds alot...but when they say STORM...it really gets me nervous. Today I am taking it kind of easy. There is lots I could do, but other than laundry (and hanging it out) and dishes and vacuuming....I'm going to relax and work on my latest cross-stitch project. Seriously....the weather around here has been something else! Even on days when the sun peeks through, we still manage rain (sometimes torrential) and thunder. My dog is no longer afraid of thunder....she barks at it and gets mad! Last evening it rained so hard I thought it was hail! Anyway, yesterday being the first day of school went well....all three seemed quite happy when they came home...stories to tell..etc. It is a big culture shock for my son though....he went from Middle School with about 150 students to High School with 1400!!! My oldest has confirmed that she will graduate early...which means she will leave school in February and do one math course at home. She will graduate in June, but between February-June will work fulltime for university. I am so proud of her for making her own decisions. At first we preferred that she stay at school for her whole grade 12 year, but realized after while that she really wanted to do this. She will also graduate with French Immersion. Tonight I am going to see Mama Mia with my two cousins! I've been wanting to see this for quite a while and the opportunity came that I could go tonight with them...so I'm quite happy about that. 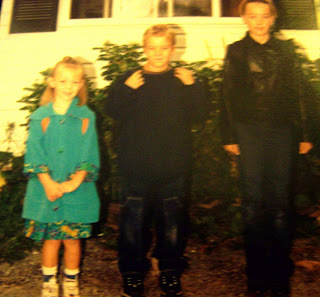 a realization that next year at this time....my oldest will be starting university. 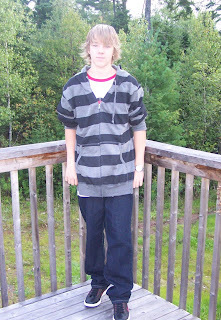 DS grade 9 and for him...first day of High School. And they were good enough to re-create a pose for me....this is a picture of a picture, so the quality is poor. 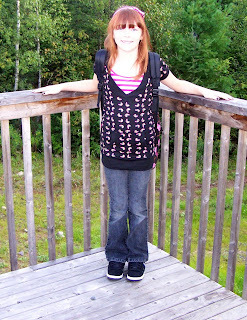 This was 6 years ago....the day my youngest started school....DS was in grade 3 and OLDEST DD was in grade 6. After a VERY rainy and windy weekend, the sun is shining today, but there is a "nip" in the air...fall is on it's way. 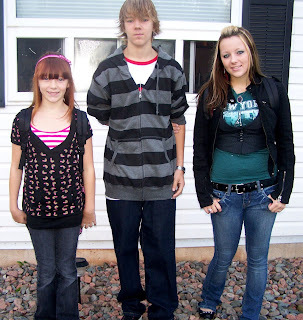 This is the last day of summer vacation for my kids...school tomorrow and a little sadness....in a way...LOL....this is the last year that all three of mine will be in school....oldest graduates...so I will take a photo of the three of them together tomorrow. I always take photos, and 6 years ago I took one of the three of them together, as it was the only year they were all in the same school, and it was my youngest DD's first day of school. My oldest is thinking of going away to university next year.....we' have lots of universities local, but they are quite a bit more expensive than some, so we'll see. I know she will to what is right for her. I have spent the morning doing laundry and trying to come up with new instructors for piano for youngest and guitar for DS. I got the piano solved, but not the guitar. DD's piano teacher isn't coming back to our area to teach and I'm kind of glad for various reasons. I spent a good part of 1/2 hour talking with a lady that will begin teaching her next week. She has a daughter the same age as my daughter, and she sounds like a really great person. She's cheaper and does her program a little different....so we'll try it. DD is excited about a new teacher and I'm hoping it all works out. It isn't looking like I will find an alternate teacher for my son. I guess I will go ahead and register him at the place he has gone the last couple of years. My son is very quiet and guitar lessons are something he enjoys. I am just not completely thrilled with the place he goes...they are expensive and the teachers are not the most qualified for what they charge. DS doesn't play in the recitals or anything...he just wants to play with the instructor each week.....I would never deny him his lessons...never...I just wish I could find someone that teaches privately like I did with the piano...in their home.....oh well. enjoy your day everyone....pictures tomorrow...I promise! !